If you’ve never had the Middle-Eastern Dish “MOUSSAKA”, you are truly missing out on life. It is a traditional Greek recipe, similar to what American’s know as “lasagna”, but even better. 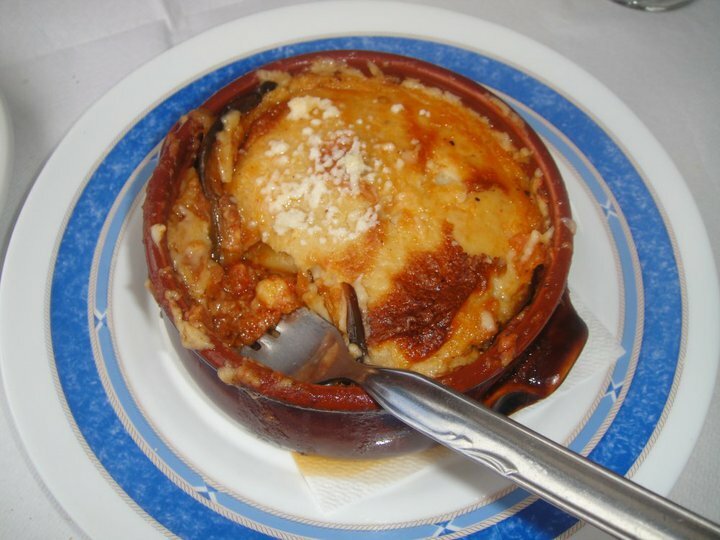 Moussaka can be made a little differently, depending on where you go, but Naoussa Resturant in Fira Santorini, Greece, I believe has the BEST home-made moussaka in the world, and trust me, I’ve tried a lot of moussaka. 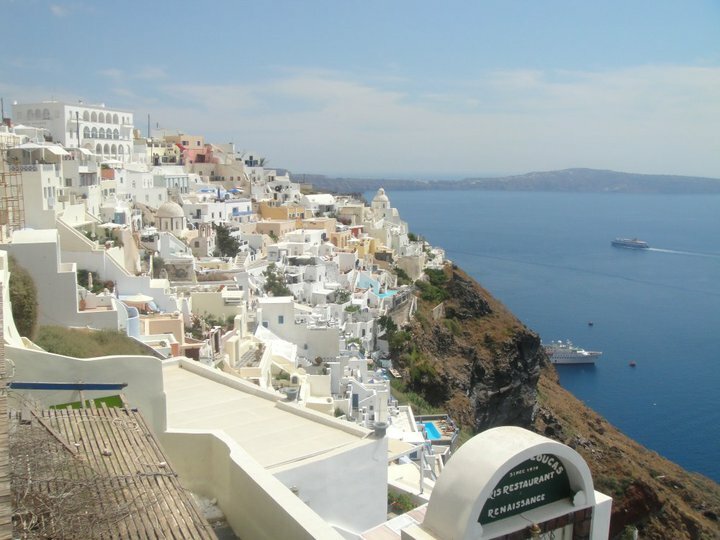 Naoussa is a cozy tavern located in one of the many charming cobblestone alleys in Santorini. I traveled to Greece in the summer with my sister, and this place took us a little while to find because there are so many little white-stone alleys that it’s super easy to get lost. Naoussa Restaurant was highly recommended by our 5-star hotel we stayed at in Santorini, and they said you must try the moussaka. They said the restaurant is known for having the best moussaka on the island, so of course I was on the hunt to find this place to see what all the hype was about. Us at the famous Naoussa Restaurant…cheers! Naoussa Restaurant is a cozy traditional Greek style tavern, and their known for having traditional home-cooked tasting meals. Nothing fancy, just good home-style cooked Greek food. The place was packed for lunch. The upstairs is an open-air dining patio overlooking the small streets of Santorini with Greek music playing in the background. The entire setting was so charming. When the waiter recommended their home-made moussaka, of course I had to order it. It was unbelievable. It was in a hot bowl with cheese oozing over the sides. It was like a deep dish lasagna made with thinly sliced seasoned potatoes at the bottom, spiced meat, eggplant, a cream sauce sauce with an abundent amount of melted grated cheese on top. The flavor was incredible and everything melted together perfectly. Everything else we ordered was great too. Great service, and friendly people. They are also known for their eggplant dip. They also bring you complimentary lemoncello shots at the end of your meal as well 🙂 It was our best meal we had in Greece. 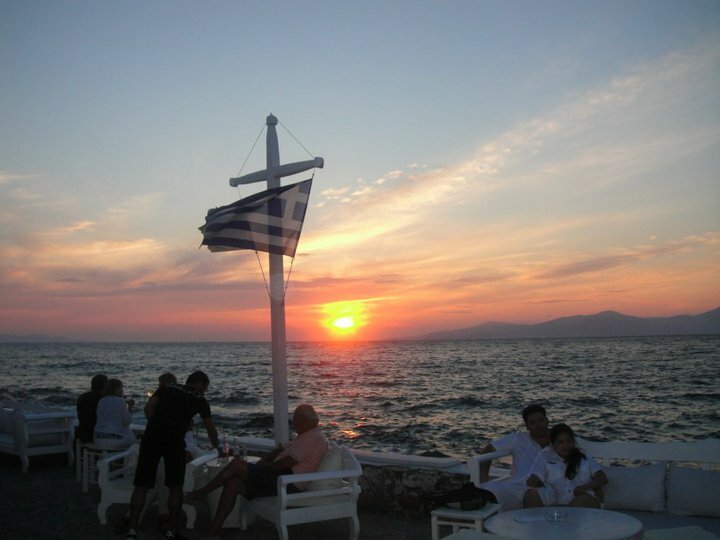 If you are ever in Fira, Santorini, Naoussa Restaurant is a MUST. Can You recommend anywhere to stay I want to go for my honeymoon for a couple of days? Any suggestions would be suitable.